This Noise Is Ours: Nunslaughter - Christmassacre 7"
This 7" was originally released back in 2004 by Nunslaughter but now Hells Headbangers have deemed it worthy of a reissue. It features four songs based around the Christmas theme, but as you'd expect from a band such as Nunslaughter, it's a theme of the devil and anti-religion. This is pure, unadulterated death metal. The sound is raw and the lyrics evil. 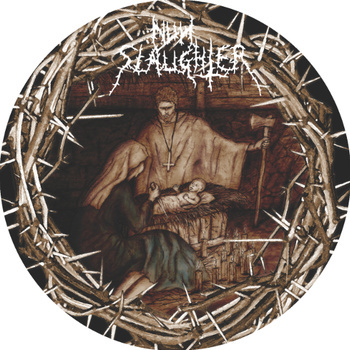 Nunslaughter seem to be one of the consistent and prevalent death metal bands at the moment, as they have been unleashing new records from every orifice. This 7" features four songs that continue the thrashy, death metal sound that we've come to expect from Nunslaughter. Rasping almost black metal inspired vocals, ritualistic guitar and a live sound steeped in the old school. Unholy Scriptures starts off at more of mid pace, after the faster tempo of opener Deathlehem. It's got a more upbeat feel to it, but the vocals are anything but! The ghoulish, shrieked second vocals on Unholy Scriptures are really unnerving. Jewrusalem is one of their most evil sounding songs on this 7". The mixture of buzzsaw guitar and those blood-curdling screams make it very satisfying indeed! They 're even able to throw in some good guitar melodies too. By the time you reach closer Unclaimed Cadaver, you'll have probably had your fill of Nunslaughter for one sitting, but if you're into your old school death metal, this will certainly be for you. Christmassacre by NUNSLAUGHTER You can pick up this 7", which comes in picture disc form via the Hells Headbangers webstore here http://shop-hellsheadbangers.com/. Nunslaughter can be found here http://www.facebook.com/NunSlaughter.